This is a sponsored post written by me on behalf of Nauzene Kids for IZEA Worldwide. All opinions are 100% mine. Nausea Medicine for Kids. How to provide relief for upset tummies. Help your child with an upset tummy from motion sickness or upset stomach from sickness. With every one of my pregnancies, I had nausea all through the entire pregnancy. I felt sick all day every day. With Brayden, I had no medicine and I threw up several times a day for the entire pregnancy. 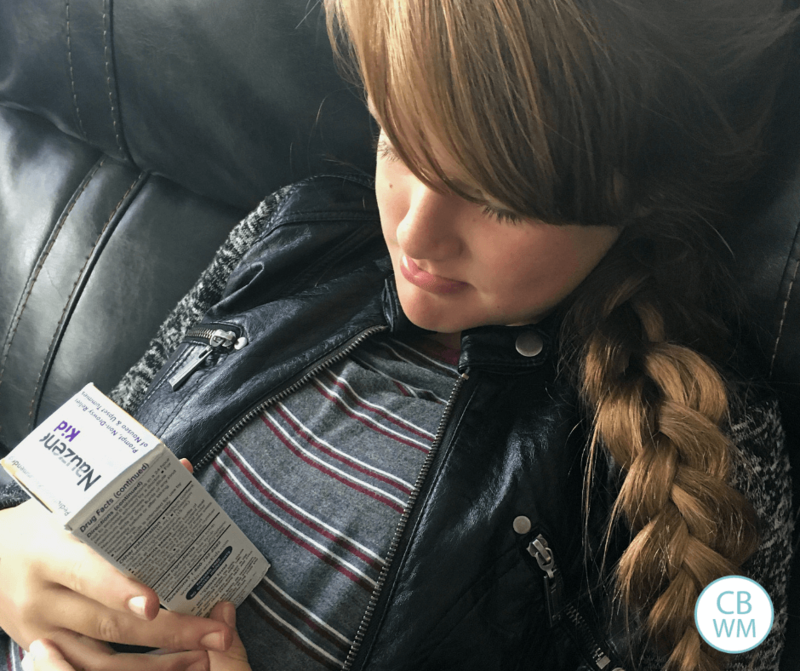 With my three girls, I was able to use more and more medications to help take the edge off and relieve some of the visits to the bathroom. I know how awful you feel when you are nauseous. It is no fun. It is debilitating. I hate for my children to feel that way. We get a child or two with a tummy bug every year as winter hits us (every parent knows what that means) and we have Kids upset stomach. We also have a couple of children who get Car sickness when we drive places, so we have some upset tummies frequently from that. I am always on the hunt to look for remedies for upset tummies. I recently heard about a new solution! It is Nauzene® Kids. It really helps with children nausea. Kaitlyn, age 11, came home one day last fall with an upset tummy. I knew when the phone rang and I saw the school’s name on the caller ID that it would be someone with an upset tummy. She didn’t want to feel like she was going to vomit, and I didn’t blame her. 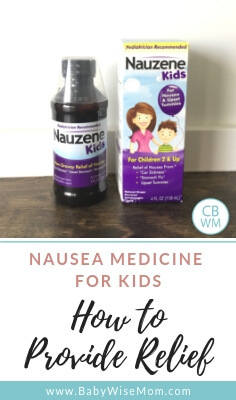 I broke out our new Nauzene Kids to solve the nausea problem. She took it and after about ten minutes felt some relief and after about twenty minutes felt even more relief. She gave her stamp of approval and told me it really worked. This product is pediatrician recommended. It provides relief for nausea from car sickness, stomach flu, and upset tummies. It is homeopathic, paraben free, and contains no gluten ingredients. It has no artificial flavors, colors, or dyes. It is rated for age two and up, which I LOVE because so many remedies you hear of can only be used on older children. Little ones get sick even more often than older children! I also love that it is a liquid medicine. It comes with a dosing cup so you can easily give this to your toddlers and older. Always be sure to use as directed. This worked really well. We will be keeping it in our medicine cabinet to turn to when that upset tummy hits. 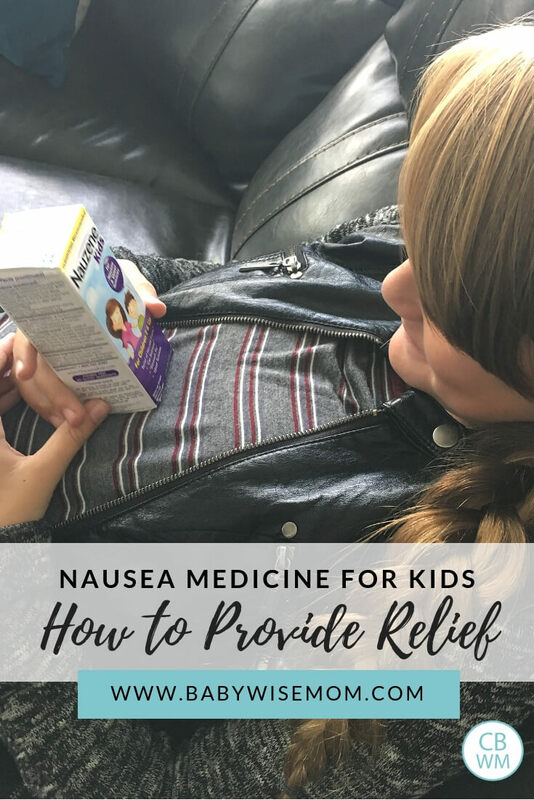 I have nothing but empathy for my children when they get sick, so I always want to have relief on hand to help them out at the first sign of tummy trouble. It is great nausea medicine for kids. You can buy it at Walmart, CVS, Rite Aid, and many retailers nationwide as well as online. I bought mine on Amazon!